Maher Samy of the High Constitutional Court (HCC) announced Thursday that both the lower and upper houses of Egypt's parliament are null and void, following the court ruling that the election of one third of the individual parliamentary candidacy seats and the Political Disenfranchisement Law were both unconstitutional. Thursday's verdict means that presidential contender and Mubarak's last prime minister Ahmed Shafiq, who would have been banned from running should the Disenfranchisement Law have been implemented, will still face Muslim Brotherhood candidate Mohamed Morsi in next week's presidential run-offs. The ruling also saw one third of Parliament voided as the elections law allowed political party candidates to contest seats reserved for individual, non-partisan candidates, thus violating the constitutional principle of equal opportunity. Law professor and analyst Hossam Eissa told Ahram Online Thursday that the recently chosen Constituent Assembly will be automatically dissolved since the law issued on Monday that could render the constitution-drafting body immune to dissolution has not yet been signed by the Supreme Council of the Armed Forces (SCAF). The ruling military council, he says, is expected to take over the legislative authority until the parliamentary elections are repeated. "We are back to square one", Eissa added. Legal expert and former head of State Council Mohamed Hamed El-Gamal confirmed that Parliament has to be completely dissolved, adding that parliamentary party members who won individual candidacy seats should have the right to rerun on party lists. "The verdict concerning the unconstitutionality of the Disenfranchisement Law was expected and so was the verdict deeming the parliamentary elections law unconstitutional," says El-Gamal, "We, as legal experts, warned in both cases that laws in general cannot be used for political purposes." El-Gamal agrees with Eissa that the Constituent Assembly will be dissolved, saying that the MPs responsible for electing the assembly's membership or who are themselves included in the assembly will no longer maintain their legal position. Based on the verdict, El-Gamal says the SCAF should dissolve both houses of Parliament and call for parliamentary elections within 60 days. Eissa, however, disagrees with the time frame saying that no document outlines when the parliamentary elections need to be repeated. The scaf desperation is indicative of both their fear of the approaching revolutionary noose round their necks and that of their western paymasters. 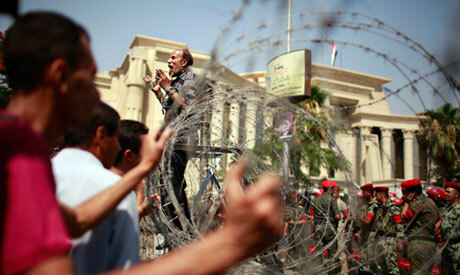 For how long will Egypt go on playing the dangerous game of dissolving-Parliament-with-Islamist-majority? Many secularists in Egypt are democratic only so far as an election result suits them (and I am no Islamist). A new Parliament in 60 days will quite likely have as many Islamists as the previous one; they will certainly not be a minority. You would be surprised... I am certain that they will become a minority, because the only way they will be garnering any votes now, is that if they buy them from the poor. There are those who claim that Egypt has a credible Justice system. This is a myth. The justice system is inherently undemocratic. It is a rubber stamp in the hands of the military establishm3ent. The courts will declare any new elections unconstitutional if the wrong people win So what is the point of holding elections if the courts would disqualify the wrong candidate, e.g. Mursi, should he win. I think Israel is right, that it is the only democratic state in the Middle East. Unfortunately the judiciary has shown its bias in this judgement and the concern for the revolutionaries that SCAF intends to retain power over the country has been confirmed. Remember that no President can be sworn in without a parliament. Thus SCAF must retain power until the next parliamentary elections (who knows when that will happen...maybe 2013, like SCAF originally intended??). In the eyes of the people, the media, SCAF, the judiciary are all one - the past regime. They must fall. You are correct, that was their sole intention when they first roled into Tarir Square under the pretence that they were protecting the revolution. All you have to do is read the Wikileaks cables and the interview Suliman gave that UK jounalist. I do support the law of the land and the decision of the supreme court. as well i support The SCAF to restore law and order in Egypt. Its time for people to go to work and to express themselves in a civilized matter. If they disagree with one candidate that they have the right to vote against him in polling stations, and not to keep demonstrating in the streets. Long live Egypt. Its very critical time in history of Egypt. We need to avoid any clash and confrontation with institutions. Its political learning process in which we will see a lot of such things which are visibly unpleasant. We need to understand and cooperate with government to put this political system back on track. free lady, you are full of balony. You seemed to be a Copt. Most dangerous entity and traitor of the Egypt. We dont need to cooperate with government to put this corrupt system back on track. You better take a hike and hide because MB will be victorious, and Scum bag SCAF will be out for good, just like in Turkey. I think Egypt will become another Algeria. The military will start massacring the Islamists and their supporters. Nezar you are some what right in you judgement. This is like Algeria, where US, Israel, and France failed Algeria's democratic path. Now the US is openly came out fighting Muslims all around the world, and will InshaAllah defeated in very near future. SCAF will be out next year completely. Egypt will win its freedom soon.